A father-and-son team created a menagerie of incredible glass models using mysterious methods. In the late 1800s a mysterious menagerie of sea creatures was let loose on the world. They came in a remarkable variety of forms: covered in spikes, writhing masses of legs, purple gelatinous lumps, transparent bubbling orbs. They swam through boarding schools in Minnesota, floating through the Vienna Natural History Museum, and squirming through a hundred high schools across Japan. At the height of their expansion, there were over 10,000, found everywhere from New Zealand to Calcutta. Astonishing in form and beauty, these creatures comprised 700 varieties of invertebrate marine models sculpted in glass by Bohemian father-and-son team Leopold and Rudolf Blaschka. They were remarkable for their fragile exteriors, scientific accuracy, and beauty. But gradually, these glass animals began to disappear, their habitats shifting into dusty closets and museum storage. People began to forget that these incredible glass creations had existed in the first place. But now, the creatures have returned. 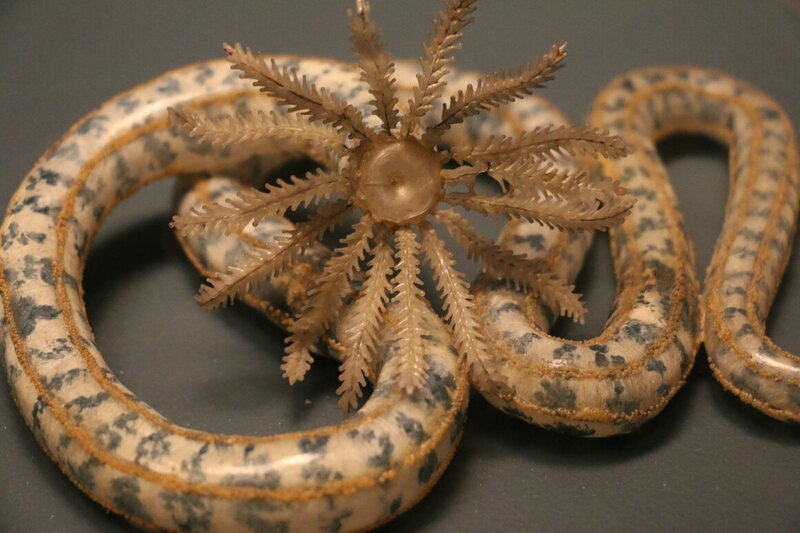 One such collection of forgotten Blaschka marine models was rediscovered in a cabinet at Cornell in the 1960s. Today, the 570 Cornell models are overseen and conserved by the Corning Museum of Glass in Corning, New York. The museum is currently showing the models in its exhibition Fragile Legacy: The Marine Invertebrate Glass Models of Leopold and Rudolf Blaschka, curated by Alexandra Ruggiero and Marvin Bolt and on view May 14, 2016 through January 8, 2017. The marine models are shown alongside preparatory drawings—nearly as beautiful as the models themselves—and the father-and-son team’s original workbench and tools. It is a deep look into the Blaschkas’ methods, which at first glance seem not just impressive to modern glass workers, but impossible. As the Corning Museum of Glass has continued to study and conserve these models, some of the mysterious techniques of the Blaschkas have begun to emerge. The world had never seen anything quite like the beautiful, scientifically accurate Blaschka models. Some were available for as little as 20 cents (adjusted for inflation, that’s still an affordable $5) in mail-order catalogs like Ward’s Natural Science Establishment. Universities and museums bought the aquatic models in bulk, and high schools around the world ordered unique glass creations as teaching tools for their classes. Even private natural history enthusiasts added them to their collections. The Blaschkas’ sea anemone, radiolarians, and other underwater creatures emerged into a world primed for them both practically and philosophically. During the 18th century, the Enlightenment and the French Revolution had left previous social and religious institutions collapsing. In their place science and education had emerged as new shining lights. While the notion of God’s fixed unchanging kingdom was challenged by evolution, the natural world was being re-created in taxidermy and dioramas in museums around the world. Zoos, botanical gardens, aquariums, and museums were busy building their own miniature man-made universes. The advent of cheap plate glass allowed for the first major public aquarium to open in 1853 in London, but museums had a problem. While they aimed to populate their collections with the world’s animals, the stranger creatures of the oceans were particularly problematic. Impossible to render in taxidermy, the ocean’s invertebrates had to be shown as wet specimens, floating in jars of alcohol. However, without bones to structure them, they collapsed into small puddles at the bottom of the jar, their colors fading away. It was this void that the Blaschka models filled, but the story begins with a void of Leopold Blaschka’s own. Born into a family of craftsmen and a maker of glass eyes and jewelry, Leopold imagined these translucent creatures captured in glass. Unbeknown to him at the time, much of the rest of his life, and his yet-to-be-born son’s life, would be dedicated to capturing that momentary vision with ever increasing amounts of scientific accuracy and beauty. On returning from his trip, Leopold remarried. His son Rudolf was born a few years later. Rudolf grew up in the family glass-making business, learning the craft at his father’s side. At the age of 23, Rudolf began professionally assisting his father. Working together, they began creating many of the glass marine-life models celebrated today. As their construction techniques got better, so did their study methods. They acquired wet specimens from around the world, went on their own collection trips, and even built a small aquarium so they could work from life. For their glass models, the father-and-son team used flame working, done over a wooden table using a foot-pumped bellows. The small bodies of jellyfish and squid were created from blown glass. To increase efficiency, the Blaschkas pre-produced many of the smaller pieces and kept them in cardboard cases. Boxes of tiny tentacles and little jellyfish heads filled their work space. For over 30 years, they likely averaged a marine model per day. They are believed to have produced over 10,000 such models in total. As the delicate models aged, they were often moved into storage, or lost altogether. For years many of the Blaschka models remained hidden in closets, their fragile bodies in disrepair. It is only recently that their delicate beauty has begun to resurface. In 2002, the new director of the Museum of Comparative Zoology at Harvard University found a collection of Blaschka marine models languishing in a storage room in their mollusk department. Leading the charge in returning the Blaschkas to prominence is the Corning Museum of Glass which, as part of their conservation efforts for the Fragile Legacy show, has begun solving some of the mysteries of the Blaschka’s unique construction methods. One technique associate conservator Astrid van Giffen has used is looking at the models under UV light to better understand the different materials the models were constructed from. As they investigate each piece, new methods and materials reveal themselves. Even as the makeup of models becomes clearer, the mystique of the Blaschkas and their marine creations continues to grow. One search the Corning Museum has undertaken is to create a map cataloging where all the models have ended up. While a number of the major collections are well known, and being conserved, the fate of many of the Blaschkas’ creations remains mysterious. Somewhere out there, specimens of a beautiful and rare species are lurking in the deep. This article is sponsored by the Corning Museum of Glass. See some amazingly detailed glass models at Fragile Legacy: The Marine Invertebrate Glass Models of Leopold and Rudolf Blaschka, on display through January 8, 2017.